In this hand, we are dealt AK in the small blind. There’s a min-raise, there’s a call, there’s another call, and hero decides to squeeze. I love the fact that we’re 3-betting. I love the size of the 3-bet. Everything here looks really, really good so far. We end up getting one caller, two callers, find a fold and go 3-way to it. Okay, nothing wrong with this so far. And we go to an AJ8 board with a flush draw. In this situation, before we even look at any of the actions, let’s just pause for a moment and look at the SPR. Against Cartman, we have about 2.5 SPR, against Nutcrusher, we have about 3 SPR. Again, I’ve talked about this a lot in the past, but whenever that SPR is 3 or less and I have top pair or better, as a pure default, I’m kind of in an ‘okay, I’m comfortable-taking-it-to-the-felt kind of mode’. Obviously, there are a couple of hands that beat us. There’s 88, there’s AJ, there’s maybe A8s if anyone has that, and there’s JJ, but shy of that, we’re not talking about a ton of combos, and there’s certainly lots of second-best combos that can and will continue. That’s kind of the first thought that I have whenever I get to a flop, especially in a 3-bet or a 4-bet pot – always look at the SPR and ask yourself how close to commitment you really are. Now just for the record, when M sent this hand in, there was no extra information attached, no HUD stats, no player information, no reads, no nothing. So we’re going to talk about this from a very zoomed-out, conceptual point of view. As-played, Hero did decide to c-bet and c-bets for half pot. And one of the major questions I asked myself, again, we’re just zooming out and talking about this conceptually, is if hero had, say, 86h or KQ or total nonsense, would hero ever c-bet for half pot on a position in this situation? So I don’t think $10 makes a lot of sense because if you’re going to bet $10 with your AK, but $15 or $16 with your bluffs, you start to have some sort of sizing discrepancy, which your opponents are eventually going to figure out. A poker leak like this can be extremely costly – so be careful about doing that, particularly with your c-bets. In this situation, I think if you’re going to c-bet, choose something a little bit larger like $15, choose a size you would actually use with your bluffs as well. The other thing I will say is I think there’s a lot of value in considering a check-raise here, simply because I think if you do check-raise, people aren’t going to assume you’re going to do it with something like AK, and as such, you can wrap a lot of semi-bluff kind of hands, but actually end up shoving with the top side of your range and get your opponents to maybe say, “Wait, wait, wait. That doesn’t make sense,” and then they give you action a little bit wider. This is certainly something you want to consider, always at least ask yourself if you can check-raise with hands like this. I know for most people, it’s just default c-bet. They don’t think twice about it, but when you’re looking at hands off table, take the time to say, “Wait, what are some other lines I have available? How are my opponents going to act accordingly? And is that line better than the default one that I would normally take.” Just a little food for thought there. After we CB, Nutcrusher does call us, we go to the turn, turn does fill up the flush-draw, and hero goes for a check, faces a bet, and then hero just decides to call. So let’s take a moment and do a little bit of hand-reading here. Of course, we should have been doing this the entire time along, but let’s at least focus on it right this moment. One of the big questions I ask myself is, is it likely that Nutcrusher has a huge hand? I don’t think AA make a lot of sense. One because there’s not a lot of combos of it, and, two, because he didn’t 3-bet preflop. Okay. If they had JJ or 88, obviously huge hands, but are they likely to slow play that on the flop when there’s so many draws present? Or can we diminish some of those combos, think that they’re going to aggress most of the time on the flop, but not always? Again, when they just call the flop, is that indicative that we’re looking more at things like single pairs, be it AX or JX, maybe draws like 9T? Do we have to panic that much here? Then the other thing is do we have to panic about the flush draws? Well, obviously the flush draw did improve, but how many combos is Nutcrusher really going to have of made flushes? The big question you ask yourself is how would they play monster flush draws on the flop? KQ of clubs, 9T of clubs, 89 of clubs where it’s the pair and flush draw. A lot of players are going to play that very aggressively, and as such, you may actually be able to diminish a lot of those combos due to blockers when they just call on the flop. So now we’re in a situation here where we don’t have to be as nervous about the 4. In fact, the 4 filling up the flush draw just gives backdoor flush draws hope, right? Maybe with AQ, with the Queen of clubs, or KJ with the King of clubs. It gives extra hope to those, but it doesn’t necessarily make a bunch of made flushes right this moment. That’s definitely something that you need to be considering. And you do so both before you check in the first place and start going into a check-call or a check-raise mode. Again, this is another great situation just to pause and say, “Wait, wouldn’t check-raise make more sense?” because do you wrap a lot of strong stuff? Does it look like you’re semi-bluffing than not or do you need check-call? Or, again, could you just have double-barrelled in the first place because you’ve kind of got to keep in mind that AK here is pretty much one of the strongest hands in your range. So how are you going to play the strongest hands in your range? This is definitely something you need to be asking yourself, and even more so when you’re playing against thinking opponents. 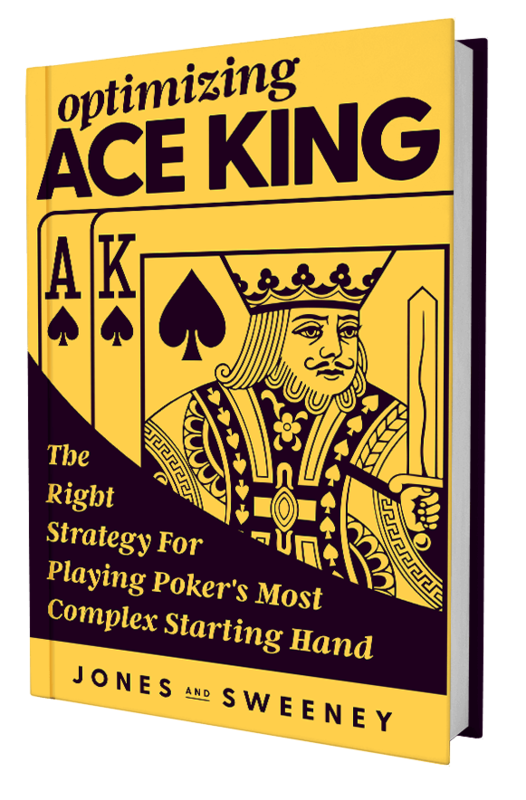 And as you’re playing higher and higher, especially online instead of live poker, you’re going to find that the average default person in your player pool is thinking at a higher level, so you need to be thinking about what you represent all along the way. This is not the same thought process I would suggest for something like $5NL, $10NL. But as you start getting into $100NL, $200NL, $400NL online, these are definitely the questions you want to be keeping in the back of your head. (Not 100% sure which limit you should be playing? Read this stake size guide ASAP). All of that to say, I don’t particularly care for the check-call. This is one where I prefer more to check-raise. I’m not super concerned about being behind. If I am going to check, I’m definitely looking more for the check/shove, rather than allow him to set the price, improve on his backdoor flush draws for cheap, and put myself in some situations where rivers can be a little awkward and uncomfortable, whereas I could have made more profit just by check shoving the turn and making him make a difficult decision. That’s just my overall thought process. Again, I’m not even saying that checking is going to be my default on the turn, but if I do, that’s the way that I would form the conversation in my head. As-played, Hero does decide to check-call on the turn, and this is what I really want to talk about. River pairs the board with the 88s, hero checks, faces a bet, and hero folds. Let’s talk about this for a quick moment. One of the things you want to be asking yourself always, especially when you’re thinking and talking about playing against better opponents, is what do you represent? What do you really have a large chunk of the time when you take this line? Always think about what you represent when your opponent thinks about your range. The thing is, if you were to cover up your whole cards right now, think about all the hands that hero would realistically have they 3-bet preflop, see you at the flop for half pot, and then check-call the turn. That looks a lot like scared kings, scared queens, scared JX, maybe scared AX. But, ultimately, it doesn’t look like a ton of strength. When that’s the case and you look at your hand and say, “Wait, I actually have AK in this spot. So I actually have one of the absolute strongest hands that I could possibly have in my range right this moment,” if you’re going to fold the absolute strongest hand realistically that’s in your range right this moment, you’re probably folding far too often. It’s just simply the nature of the beast. And when that’s the case, you make yourself wide open and exploitable to bluffs. The issue here is that you’re getting 2.7 to 1 on a call. I don’t think that there’s any way that you can say you’re behind often enough. And, two, based upon the fact that you did take such a passive line with the smaller bet on the flop with just the check-call on the turn, another check on the river, you rep very, very weak. I think you open yourself up to your opponent either thinking that they’re value betting with hands that you beat, or thinking that they can bluff you off of things like KK, QQ. Ultimately, I think by folding here, you’re leaving a ton of money on the table. You took a line that induced bluffs. And when you take a line that induces bluffs and you’re putting yourself in a bluff catch mode, you actually have to do the bluff catch thing. If you don’t, then you’re folding far too often and you make yourself a massive target to people just bluffing you with impunity because if you’re folding the absolute strongest hand your range, well, again, it’s not too difficult to punish someone like that, and this is the stuff you want to be looking for and taking advantage of in your opponents, but not letting them take advantage of you that same exact way. So, M, hopefully this helps the next time you find yourself in a similar situation. Thank you so much for sending this hand in. And I know this was a lot of food for thought, again, especially about the bet size on the flop thinking about your value to bluff hands and which size you would choose with each. I typically don’t suggest much bet size forking on the flop specifically, and then also thinking about check-raising as an option, making sure that if you are going to go for check-calls with your really top side of your range, thinking about are you over folding them anywhere along the line, especially on rivers where those mistakes can really, really cost you. Again, this was a lot of stuff, a lot of food for thought, but, ultimately, this all boils down to some hand reading and a lot of frequency focus and making sure that your betting frequencies are correct, making sure that your ratios in your betting is correct, making sure that you’re not over-folding in situations and that you’re looking for opponents who are over-folding in a lot of situations. This is all stuff I covered in my brand new course called ‘The One Percent’. This is a companion video series to the popular Poker’s 1% by Ed Miller, and something that I definitely suggest you check up on if you’re interested in learning more about this stuff. Honestly, frequencies are everything in poker, even though a lot of people don’t realize it.